The Plains, Va.'s Karen O'Connor was in ninth place overall after her dressage run on the first day of eventing in equestrian at the London Games. However, with Sunday's riders added in, she dropped to 29th place overall. As a team, the U.S. squad sits in seventh headed into the cross-country event. 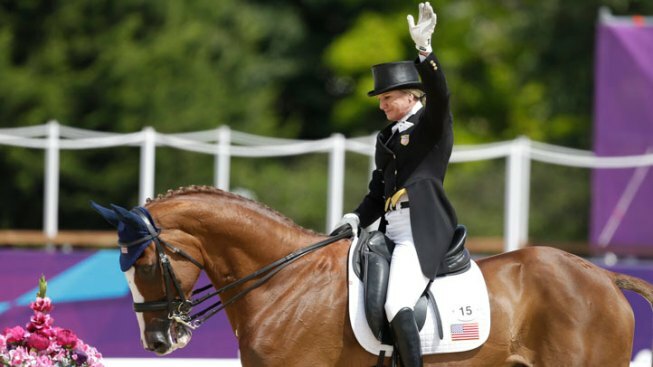 O'Connor, the oldest U.S. Olympian in 2012 at 54, rode Mr. Medicott, a 14-year-old Irish Sport Horse, in the event. The U.S. Equestrian Federation said that O'Connor "swapped her snaffle for a double bridle," on Saturday, which was "a change that gave her more control" of Mr. Medicott. O'Connor explained the decision to the USEF. "It gave me a little bit more leverage to keep pushing, which is what saved me in there," O'Connor said. "He was perfectly light and right where I wanted him to be (when I went in) and then something caught him out of the back of his eye." O'Connor finished first among the three American riders who competed Saturday. She finished with a 48.2 in penalty points. Boyd Martin of Cochranville, Pa., had 50.7 penalty points on Otis Barbotiere while Tiana Coudray of Ojai, Calif. had a 52.0 on Ringwood Magister. Those scores placed Team USA in third place overall, but only half of the field had finished dressage. Two more Americans rode Sunday -- Will Coleman and Phillip Dutton. Dutton scored a 44.1, while Coleman, of Charlottesville, scored a 46.3.